What is "Harvest"? Driving through Malibu with the fam last month I spotted this on the back of an L.A. area taxi cab; I'm assuming similar ads are up all throughout Los Angeles. According to their website, Harvest events are designed as opportunities for Christians to invite family members, coworkers, friends, and acquaintances to hear the life-changing message of Jesus Christ in an engaging, non-threatening environment. Here's a short promotional video from last year's event. If it sounds like an updated version of a Billy Graham Crusade, well ... it's because it is. 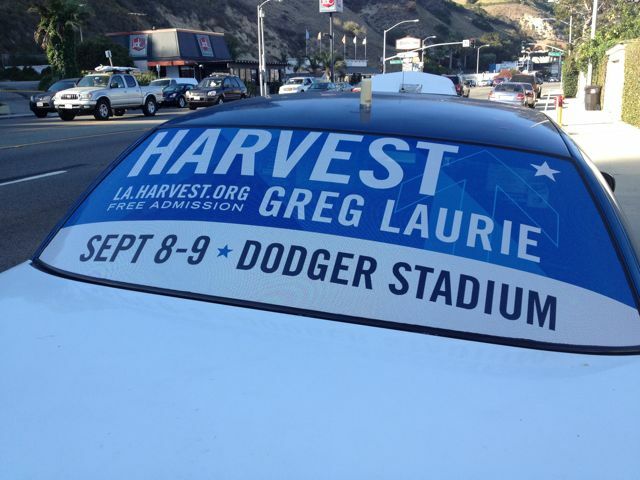 Dodger Stadium at last year's Harvest event. I actually had a chance to attend a Harvest event several years ago. I like to think of it as attending a church service - with 50,000 of your closest friends. Harvest is an an opportunity for both religious and non-religious people to answer life's most important question: "who is Jesus?" 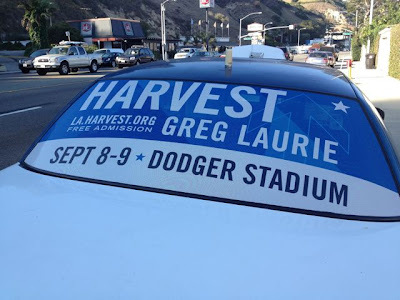 Above: an informational video from Harvest on the 2012 event, including some thoughts from speaker Greg Laurie. 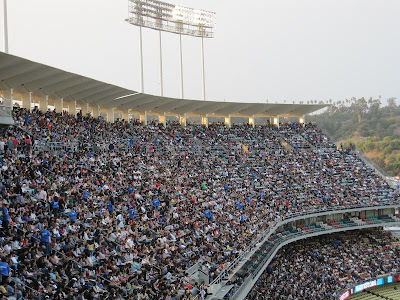 Cost for the event: FREE (Dodger Stadium charges $15 car for parking). Three years ago I took an early morning walk up Santa Monica Blvd, following the course of Historic "Route 66" through Santa Monica and on into West Los Angeles. Here's a link to last week's post on that. I began to wonder, how far could I go if I got a really early start? Could I make it all the way to Century City (just shy of Beverly Hills)? A week later I decided to give it a shot. 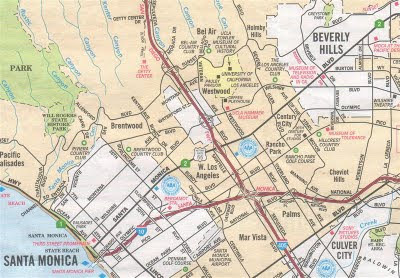 The above AAA map gives a better feel for the patchwork of mulipalities that is Los Angeles: Santa Monica, Beverly Hills, and Culver City are all seperate, independent cities. The city of Los Angeles is pretty much everything else. I showed up at Santa Monica Blvd and Ocean Ave at 5:45am. Crazy, I know. And dark. This is looking out at the Santa Monica Pier at 5:45am. Looking north up Ocean Avenue. Walking up Santa Monica Blvd, I made good time. I didn't stop to take any photos. Too dark, and besides, I had already taken a lot of photos along this same strech the week before. A couple miles up, at the corner of Santa Monica Blvd and Cloverfield, I did notice the "sale" price for a couple of bikes in the window at Cynergy Cycles. The same price I paid for my car. Another bike was on "sale" for $5850. I guess I have no concept of what top-end bicycles go for. I paid $150 for my used mountain bike 18 years ago. Cynergy Cyles like a nice enough bike shop. But I think I'll stick with my 18 year old bike for now (and hiking and walking, which doesn't cost anything). Walking up Santa Monica Blvd into West L.A. I noticed a stationary helicopter in the air (actually, a couple). A major accident on the freeway? Police activity? A movie shoot? Nope. A fire, a major fire. Santa Monica Blvd. was completely closed from Bundy all the way to to Barrington (about half a mile). Apparently, there was a major fire in the mini mall I had walked by a week earlier, at the intersection of Santa Monica Blvd and Brockton. A local news reporter and camera crew were there for the "all important" live report. Pedestrians were permitted in the area - of course, we were expected to stay out of the way. 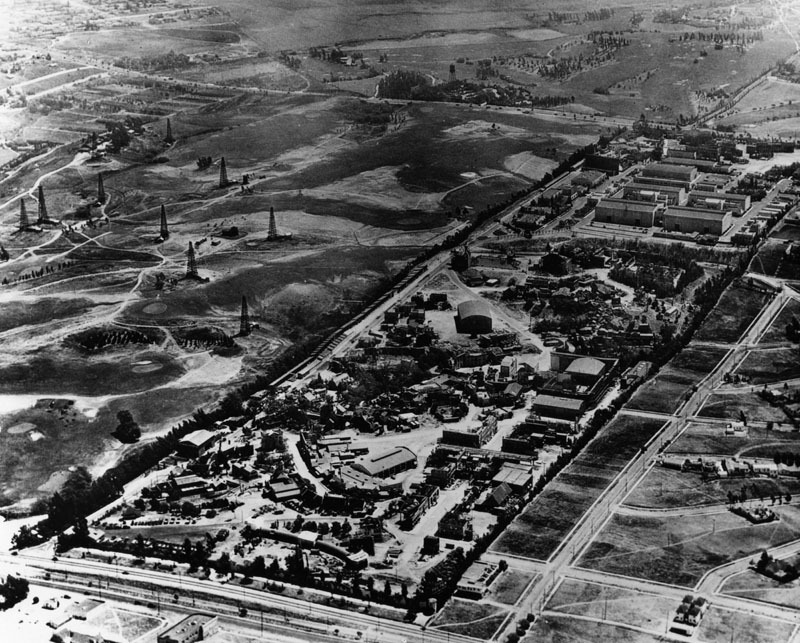 This being Los Angeles, I kept thinking, "so where's all the lights and equipment and camera crew and catering trucks?" Maybe I lived in L.A. too long. The side of one of the fire trucks. I've always liked design the City's seal, with the "four flags" that have flown over Los Angeles: Spain, Mexico, the California Republic, and the United States. A group of firefighters debriefing. Always impressive. According to one of the firefighters I asked, this is only a third of the truck and equipment at the scene earlier in the morning. Apparently, they had crews from all over the City here, over 200 firefighters. More trucks and equipment on Armacost Street. Many thanks to the men and women of the Los Angeles Fire Department. More on the walk up Santa Monica Blvd next week in Part III. Three summers ago, our work took us to Chicago for six weeks (topic for another post), the starting point of historic "Route 66". 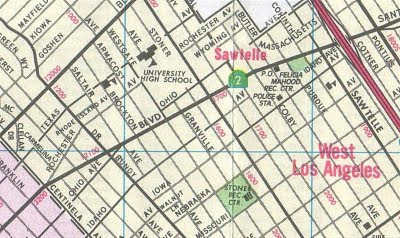 Back in Los Angeles, I decided it'd be interesting to walk along the last final section of Route 66 that goes through Los Angeles and Santa Monica. I got started about 6:30am and parked on the corner of Ocean Avenue and Santa Monica Blvd. Free parking on the street until 9am: great. I walked across the street to the cliffs, and got this early morning photo of the Santa Monica Pier (above). Another nice shot looking north towards Pacific Palisades and Malibu. Looking across Ocean Avenue up Santa Monica Blvd. This is the official end of Route 66, and the beginning of my walk. Crossing the street, Santa Monica Blvd street sign with the palm trees of Palisades Park in the background. A final look at Palisades Park and the Pacific Ocean. It was a great time of the day to be there. Some of office buildings in the business district of Santa Monica. Third Street Promenade, normally very busy and lively with both tourists and locals, was quiet. The tall buildings office buildings near the Third Street Promenade drop off quickly. 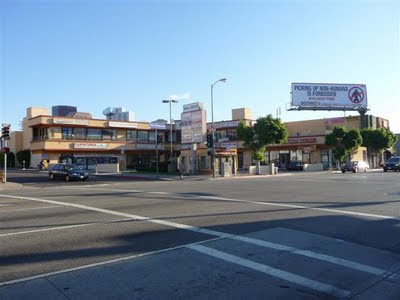 Santa Monica Blvd has lots of older, interesting one story commercial buildings. This is one of several new condo developments popping up along Santa Monica Blvd. Staring around 10th Street, or so, are a dozen small car dealerships on Santa Monica Blvd, a couple of which are in beautiful, historic buildings (above). Years ago, my dad helped me negotiate the price for a used car in one of these places (man, he was good). This old brick building on the corner of Santa Monica Blvd and 15th Street really caught my eye. I really like the mixture of architecture styles found up and down the street. You won't find any "big box" stores (Home Depot, Target, WalMart, etc) anywhere in Santa Monica. Here's the local Busy Bee hardware store. Looks like it's been around since the early days of Route 66. Another interesting building: classic art deco architecture alongside some beautiful palms. Looking west from Santa Monica Blvd around 20th Street, or so. Mostly two and three story apartment buildings and condos ... with the Santa Monica Mountains in the background. 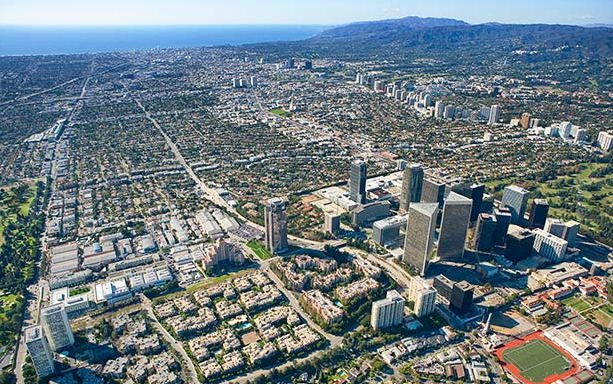 Nothing special about this shot - except that it seems so "typical" of Santa Monica and the westside of Los Angeles. Walking up Santa Monica Blvd. from the ocean had me crossing over from the city of Santa Monica to the city of Los Angeles at Centinela. 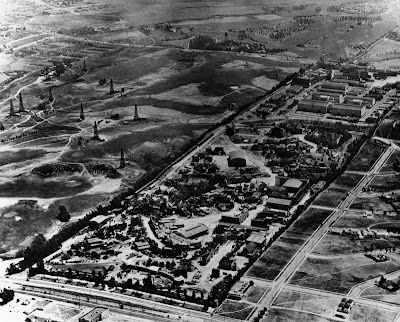 This part of L.A. is called "West Los Angeles" (not to be confused with "the westside" of Los Angeles - technically a much bigger area). Crossing over into West L.A. I noticed a plethoria of "mini-malls" - most of which sprang up in the 1980's. They come in a variety of shapes and sizes. These are just a few of the many I saw in a one mile stretch through West L.A. On one hand, they're considered fairly ugly in terms of architecture and overall athestics. Many of them are on the sites of former gas stations. On the other hand, they provide much cheaper retail space for merchants and their customers. Not everything can - or should - be Rodeo Drive. Yet another mini mall. Little did I know that this one at Santa Monica Blvd and Brockton would make the news in less than a week - stay tuned. I walked to Barrington Drive - a little over three miles, then took a MTA bus back to my car. Nice walk ... wonder if I could go further next time? More next week in Part II.